Spacious Craftsman Traditional in North Berkeley with Views and a Lap Pool! 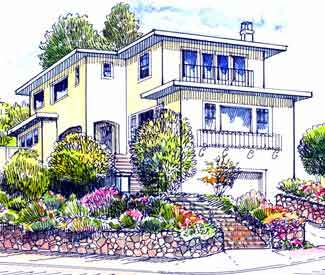 This wonderful home is located on a corner lot with Bay and Golden Gate Bridge Views. The kitchen with a breakfast room and the formal dining room lead directly to a deck and a lovely garden. The level lawn area and a fabulous 50 foot lap pool with an adjacent spa are a wonderful bonus. There is also an attached garage with interior access. Located in close proximity to Solano Avenue and North Shattuck Avenue's Gourmet Ghetto, this home provides the perfect setting for comfortable living. The well proportioned and light filled rooms balance the Craftsman features that include built-ins and detailing of gumwood and hardwood floors throughout.